The mates place is incredible, if you want to make party you have to go there ! 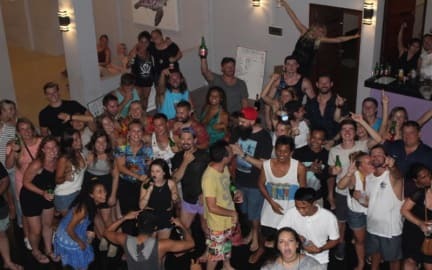 It’s really an party hostel every single days ! Also the rooms are so comfortable everything is clean, the bathroom aswell is so nice and clean. The free breakfast is really good (everything you need on an hangover morning ahah) Thank you to the team and see you next time ! Super ambiance, personnel hyper sympa, le soir tout le monde se rejoint en grandes tablées, c'est sympa. Les chambres sont propres et climatisées. Les salles de bains sont propres et grandes, avec plein d'espèce pour se changer ! En plus ils organisent des tours (3 îles) vraiment bien. C'est top ! J’ai voyagé beaucoup et cet endroit est dans mon top 3 des auberges favorites!! L’ambiance est super et c’est très propre. Je recommande vraiment! Best place in Gili T. The staffs are extremely friendly and helpful and the daily parties are really fun. I strongly recommend this place and I’ll go back in winter break for sure! Bel endroit, le personnel ,super gentil, bien situé.Je recommande fortement. Staff incroyable ! Hostel propre, ambiance de fou! Booked 2 nights, ended up staying 4... Best place to party and meet people! Highly recommend!